"You may fire when ready." 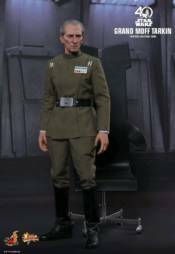 - Grand Moff TarkinAn ambitious, ruthless proponent of military power, Wilhuff Tarkin became a favorite of Supreme Chancellor Palpatine and rose rapidly through the Imperial ranks. Tarkin saw the Death Star as a way to crush all dissent to the Empire's rule with the fear of the station's planet-killing superlaser and made a terrifying demonstration of the stations power by destroying Alderaan in front of Princess Leias eyes.Today Hot Toys is very excited to officially present the highly anticipated 1/6th scale collectible figure of Grand Moff Tarkin from Star Wars: A New Hope!Meticulously crafted based on the appearance of Grand Moff Tarkin in Star Wars: A New Hope, the figure features a newly developed head sculpt with phenomenal likeness, a finely tailored Imperial uniform, Grand Moff Tarkins high back chair, and a specially designed figure base.The Grand Moff Tarkin collectible figure will surely be an excellent addition to "fire" up your Star Wars collection!